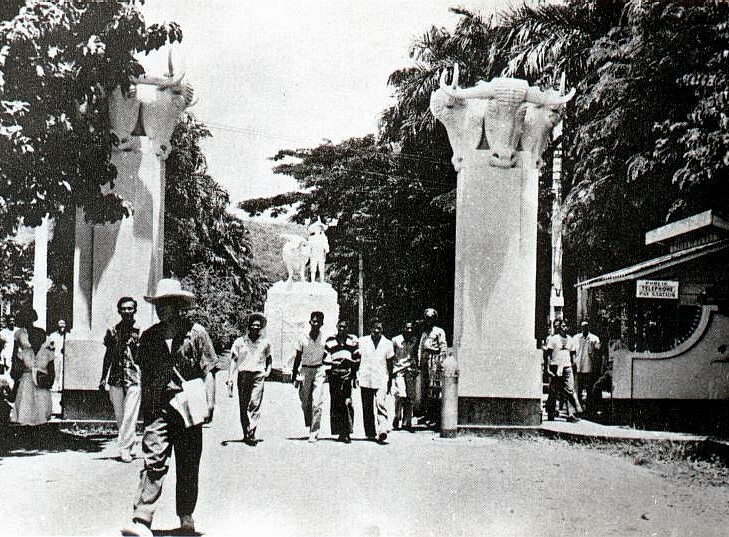 Perhaps one of the most popular landmarks of the then UPCA was its gate, distinctive because of the heads of carabaos atop each of two concrete tower-posts, as well as the farmer-and-carabao statue. 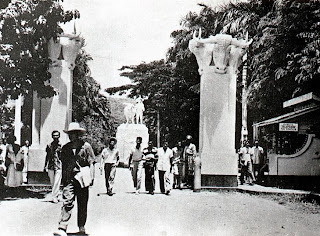 In the mid-60s these were moved back to where they are now, the UPLB Alumni Plaza. Today, the UPLB Gate has two tower-posts with mosaic artworks depicting the scientific and educational programs of UPLB. In 1934, this was how the Royal Palm Drive looked like (view from the UPCA Gate). The building on the left side of the picture was the Department of Plant Pathology (DPP) building. Today, the Royal Palm Drive look like this. The building on the spot where the DPP used to stand is the UPLB Administration building. Last year, the Offices of the Chancellor and Vice Chancellors transferred to the third floor of the UPLB Library. The Office of the Dean, College of Agriculture, has moved in to the former Office of the UPLB Chancellor. This building was UPCA’s Library of past years. It hasn’t changed much, except that it’s now known as the UPLB College of Arts and Sciences Building, housing the CAS Dean’s Office and the Department of Humanities. The basement of this building used to house the College Post Office, the Farm and Home Development Office (precursor of the OVCRE), and the then Department of Agricultural Information and Communication (precursor of the College of Development Communication). This is now the Department of Citizen Military Training (which used to be Department of Military Science and Tactics when ROTC was still required), but this used to be the UPCA Infirmary. Behind this building is the famous Baker Hall, which used to house the then Department of Military Science and Tactics of UPCA. The building to the left used to be known as the Farm Management Building of UPCA that housed farm machines and implements. 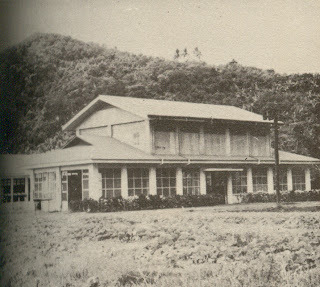 Today, it houses the UPLB Station of PhilRice (right). They have added a couple of new buildings (buildings at left and right of pix). UPCA students in the first years of the College built their own residences (right). Today (picture below), UPLB has this row of dormitories (Women’s Dorm to the right, Veterinary Dorm at center in the background, and Coed Dorm at left. the Men’s Dorm (not shown) is located to the left of the Coed Dorm building). This (right) was the old St. Therese Chapel. In the 70’s the new chapel was constructed and the picture below shows how it looks today with its new bell tower. The old Chapel is still there (right side of picture below). The Azkals may have popularized soccer in the Philippines, but in 1930, UPCA already had its own soccer team. of the bottled water industry in the country. 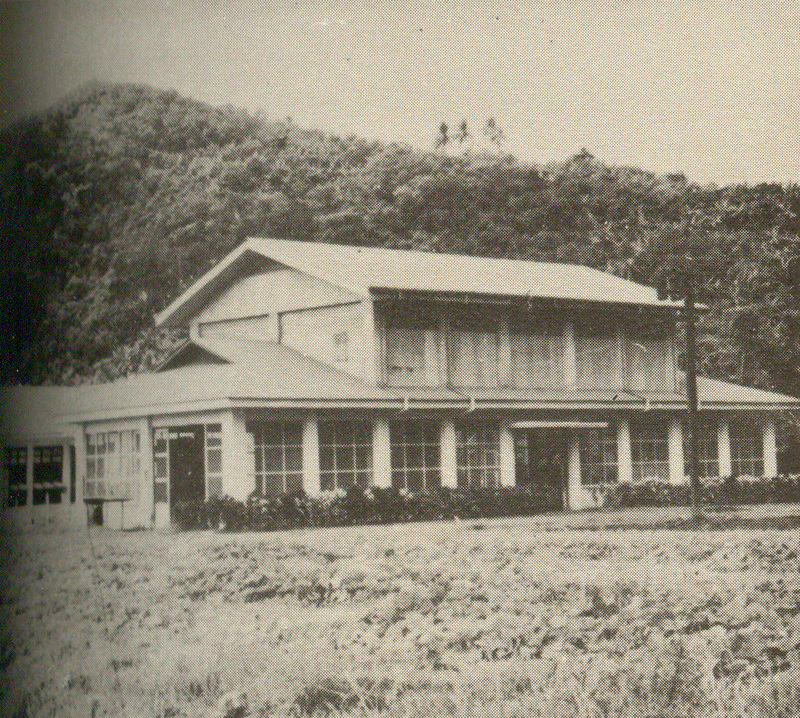 In the 1930s, there was a bottled water plant in Los Baños, called ISUAN. This was the Calamba-Los Baños Road in 1915, view from Calamba Crossing. There were only Kalesas then and certainly there was no traffic jam on the 15-km stretch. Today, the distance from Calamba Crossing, through Lecheria, Bucal, and until Pansol is completely filled with both residential and commercial buildings. This road, connecting Calamba and Los Baños now takes, on the average, about an hour to negotiate due to heavy traffic on a daily basis. We used to traverse this by jeepney in the 60s for only 15 minutes. In the late 1970s and early 1980s, fish cages and fish pens became popular in Laguna de Bay. I recall having hosted a radio program for fish cage and fish pen operators and caretakers called ORAS NG MANGINGISDA over Radio DZLB, the rural educational radio station of UPLB. 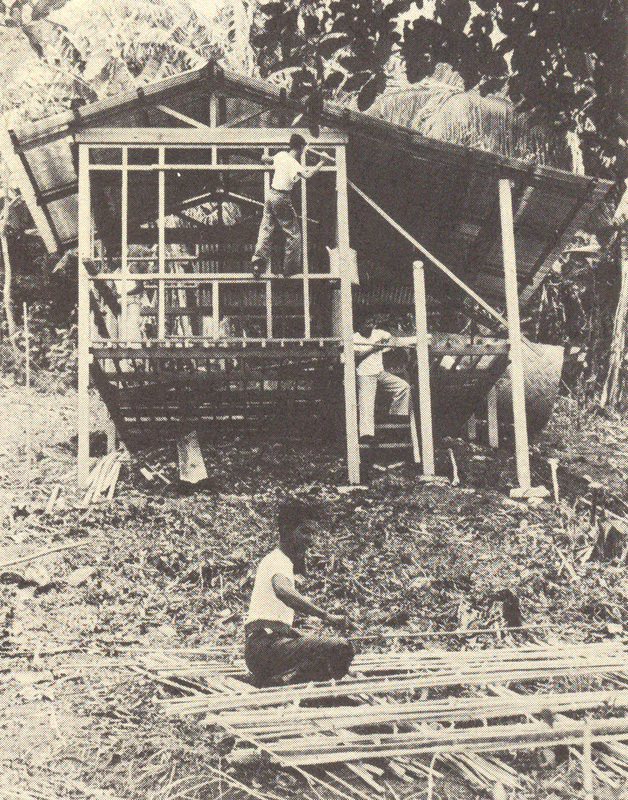 That program promoted use of fish cages and fish pens which were then new technologies from the Fisheries Commission (precursor of today’s BFAR). In the coastal area of Mayondon was a place known then as Malakoko Beach, where UPCA students used to swim and picnic up until the very early 60s. This picture shows old fishpens in the Mayondon area. They contributed largely to the pollution of the waters in that place. Those fish pens aren’t there anymore, but the waters have continued to become dirtier and dirtier. At the Mayondon point, in the early 60s waters there used to be as deep as 2 meters and the bottom was all sand. Today, the water is no more than one meter deep and the silt is at least 1.5 meters deep. The water color is dark brown.